It's a drug-free Philippine province with an almost zero percent crime rate. Updated on February 13, 2018: On February 12, Cebu Pacific announced that they're launching a direct commercial air service to from Manila to Batanes starting March 25. According to Spot.ph, the local airline will fly from NAIA Terminal 4, Manila to Basco, Batanes once a day at 6:20 a.m.; the return trip will be at 9:15 a.m. More details here. 1. Flights to Batanes are more expensive than Hong Kong. There are only two airlines that offer flights to Batanes—PAL and SkyJet. Regular roundtrip tickets cost around P12,000 to 18,000, while budget flights go down to around P8,000 to P10,000. Needless to say, you can fly to Singapore, Hong Kong, and other Asian destinations for less. While we’ve heard of travel bloggers who were able to score P2,000 to P6,000 tickets to Batanes, you’d have to stalk the website and FB pages of the airlines every day until that rare, magical moment pops up. 2. It’s like a completely different country. There’s a reason why Batanes often makes it to listicles that feature foreign-looking local destinations. Located at the northernmost archipelago of the Philippines, Batanes’ chill vibe, picturesque geography, and preserved culture will make you feel like you’re in a different country, especially if you’re coming from the congested city of Manila. Batanes is often compared with Scotland and New Zealand. If you ask those who have seen the breathtaking views of Batanes’ Marlboro Hills and Vayang Rolling Hills, the pricey airline ticket is worth it. 3. You have no choice but to unplug. While many accommodations provide free Wi-Fi, expect that you will probably never get to tweet until you’ve returned back to Manila. The most decent Wi-Fi we found was in Fundacion Pacita, the most expensive hotel in Batanes. Only two to four people at a time were able to successfully connect to their Wi-Fi. Your Instagrams will just have to be #Latergrams. Even texting is a challenge, as the intermittent cellphone signal is most often zilch. 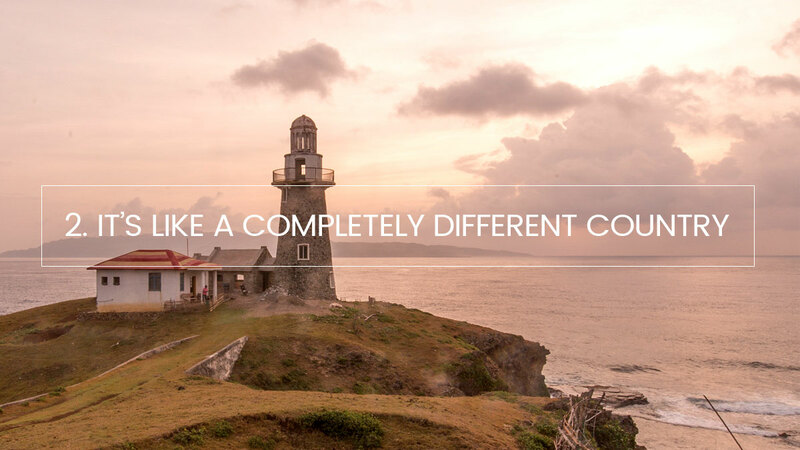 Just accept defeat, disconnect, and enjoy Batanes without social networking. 4. There are no high-rise buildings. Except for the famous lighthouses, chapels, and PAGASA weather station, there are no tall infrastructures in Batanes. Even their hotels don’t go beyond two to three floors in order to blend in with the natural landscape. In 2016, the Senate finally approved a bill declaring Batanes as a cultural heritage and ecotourism zone. This bill aims to prevent unplanned and destructive tourism, even with the increase of tourists flocking to Batanes. 5. They might offer you the coconut crab, but please say no. The coconut crab, also known as palm thief or robber crab, is known for its big, powerful claws. When it’s hungry, it climbs a coconut tree, clips the coconut from the branch, and falls to the ground with it. It spends hours peeling off the husk to reveal its shell, punches a hole through the soft spot, and then eats the coconut meat. Another thing about the coconut crab: It’s an endangered specie! The government prohibits the catching, killing, selling, and trading of coconut crabs. Unfortunately, many restaurants in Batanes are unaware of this rule, or are probably just turning a blind eye. If you see it on the menu, say no and remind the owners that it’s against the law. 6. Honesty is their best policy. Coconut crab issue aside, if you’d like to see how honest the people of Batanes are, visit the Honesty Café on National Road, Ivana. There are no waiters or security guards to watch over the café—not even the owners, who are busy tending to their farm nearby. The café works on an honesty system: You pick an item, look at the price tag, drop the exact amount of payment in the money box, and jot down what you purchased in the log book. If you need change, just write down your name, the amount you placed in the drop box, how much change you need, and then come back for it the next day. Honesty Café has been successfully operating since 1998. As for the rest of Batanes, they have an almost zero percent crime rate. Just this year, it was declared a drug-free province. Yes, there is still hope left for our country! One thing you’ll notice as soon as you arrive in Batanes is that their pace is slower than the city life you’re used to. Please don’t lose your temper if their customer service isn’t swift and your food takes a while to arrive in restaurants. Don’t turn up your music too loud because the town is used to peace and quiet. Instead of rushing to get driven from one spot to another, try renting a bike and explore the neighborhood’s hidden coffee shops. Batanes’ laid-back vibe will teach you to slow down, and as they say, stop and smell the roses.